There are 13 People’s Choice winners this year who will each receive the coveted crystal People’s Choice Stevie Award in Las Vegas. 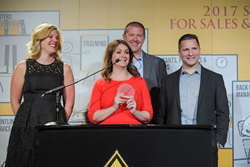 All organizations honored in the Customer Service Department of the Year categories of this year’s Stevie Awards for Sales & Customer Service were eligible to be included in voting for the People’s Choice Awards. More than 124,000 votes were cast this year. Nicknamed the Stevie for the Greek word “crowned,” the awards will be presented to winners at the 12th annual Stevie Awards for Sales & Customer Service awards banquet on Friday, February 23, at Caesars Palace Hotel in Las Vegas, NV. Tickets for the event are now on sale. More than 600 executives from around the world are expected to attend. The presentations will be broadcast live via Livestream.